In today’s What to Watch For we are starting to see the schedule get ever more crowded at the 2014 World Series of Poker with no less than six different events in action. There’s a lot to look forward to, then, although the conclusions of Event #2: $25,000 Mixed-Max No-Limit Hold’em and Event #3: $1,000 Pot-Limit Omaha will likely earn most of the attention where the next two bracelets of the summer will be won. They called an audible of sorts last night in Event #2 where the original plan had been to stop with four players left, then return to finish things today. The “mixed-max” format which has players move from nine-handed to six-handed to four-handed to heads-up meant that the 16 returners yesterday played 4-max. until just four remained. That’s when it was decided to go ahead and play the semifinal heads-up matches yesterday which saw Jason Mo defeat JC Tran relatively quickly, then Vanessa Selbst engineer a lengthy comeback versus Al Decarolis to make today’s final match. 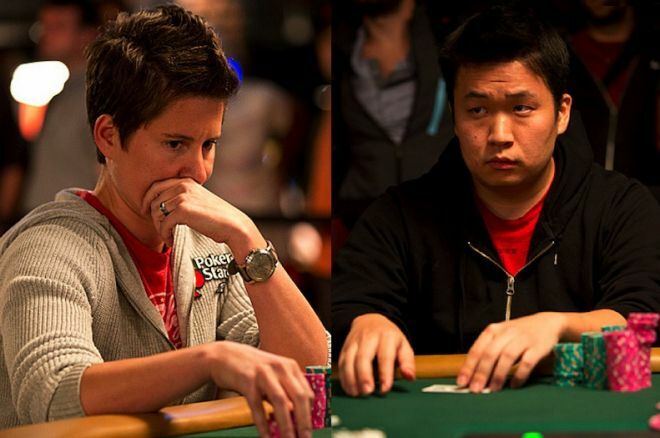 Both players carry their stacks forward, meaning Mo will begin with an edge with 5,860,000 to Selbst’s 3,960,000. Mo has enjoyed significant heads-up tourney success in the past, and today looks to go one spot further in a WSOP event after having finished runner-up to Brian Hastings in the $10,000 Heads-Up No-Limit Hold’em event in 2012. Meanwhile Selbst seeks her third career WSOP bracelet after winning her first in 2008 in the $1,500 pot-limit Omaha event, then another in 2012 in the $2,500 10-Game Mix. The final match begins at 2 p.m. PDT, which is when hand-for-hand coverage will begin on the live reporting blog. Event #3 will also finish today, having careened forward to reach a final table early last night, after which they continued to play down to just six players before stopping. Like Selbst, Steve Billirakis will be looking to win a third WSOP bracelet in this one, as he enjoys the chip lead to start play today. Billirakis won his two bracelets in 2007 in a $5,000 Mixed Hold’em event (the very first event of that year’s WSOP) and in 2011 in the €5,300 Pot-Limit Omaha event at the WSOPE. Follow the Event #3 live updates starting at 1 p.m. Vegas time to see who among these half-dozen hopefuls wins the gold. As expected, this first open-field, low buy-in, no-limit hold’em tournament had a large turnout with 2,224 taking part — the biggest field so far in this year’s WSOP — which means a greater than $2 million prize pool with a first prize of $360,435 awaiting the winner. Here again we’re talking about a player gunning for a third WSOP bracelet, as two-time WSOP event winner Mark Radoja returns to one of the bigger stacks in this one with 186 players left. Miguel Proulx, Scott Baumstein, and Jeff Gross also have chips to start Day 2 with a long way left to go. Start checking the Event #4 live updates at 1 p.m. today to see how things proceed in the march toward Saturday’s final table. As expected, most of poker’s biggest names took part in the first $10K event of the summer, with 120 turning out for Event #5. After lots of discards and draws in the 2-7 triple draw event, just 52 return today with Mike Peltekci leading the counts with 171,100, followed closely by Sergey Rybachenko (157,600) and Tom Schneider (155,300). The longer Schneider remains at the top of the leaderboard, the more excitement should build as he is seeking a fifth career WSOP bracelet. That said, there are others with lots of WSOP gold also currently near the top, too, with Huck Seed, Eli Elezra, and David Chiu in the top 10 and Barry Greenstein in 11th position to start today’s play. Play picks back up at 2 p.m., which is when you can start checking the Event #5 live updates as this one proceeds toward a final table. The first of the popular “shootout” tournaments gets going today, those events in which players need only win a couple of sit-n-gos to reach the final day and a shot at WSOP glory. Simeon Naydenov is the reigning champion in this event after having topped a field of 1,194 players last year to win a $326,440 first prize. This will be the first event in action today with a noon start, so begin hitting refresh over on the live reporting pages then. Finally, the game that everyone loves to hate makes its 2014 WSOP debut this afternoon with Event #7, the $1,500 razz event. After several years of the razz event featuring a $2,500 buy-in, the price tag has been lowered this year which will likely mean a larger turnout. Last year Bryan Campanello outlasted David Bach heads-up to win the title and a $178,052 first prize in the $2,500 razz event in which 301 took part. Play begins at 4 p.m. local time in Event #7, so again be sure check the live updates starting then to follow players trying their best to make the worst hands they can.